Combine the diced fennel head, sachet, and olive oil in a small sauce pot; bring to a simmer. Cook the fennel on low heat until very tender, about 25 minutes, and allow the fennel to cool in the seasoned oil. Once cool, strain the fennel and reserve the oil. Prepare a gas or charcoal grill. Cut off either end of the Meyer lemon so it will stand vertically; cut into quarters. Stand up one quarter at a time, and cut straight down with a knife to remove the entire core and half of the flesh, reserving both pieces. Repeat with all the wedges. Cut the lemon zest and flesh into a small dice and place into a small bowl. Squeeze the juice from the core over the diced lemon. Season with salt and pepper, and allow to marinate for 20 minutes. Add the diced shallot to the lemon, as well as the cooled oil from the braised fennel. Stir in the chopped fennel frond, and adjust the seasoning if needed. Lay eight 7-inch squares of parchment paper on a dry surface, and brush the center of each with braised fennel oil. Over each parchment, give a pepper mill a couple of turns. Place 1 sardine, skin side down, on the paper. 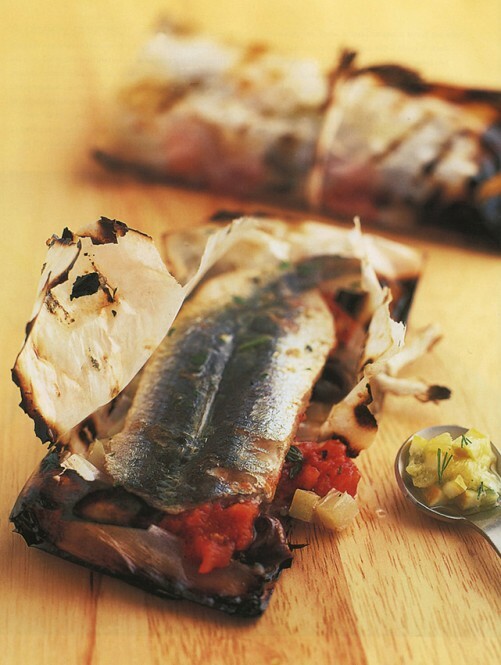 Cut 1 tomato fillet in half lengthwise, and place the halves on top of the sardine. Spoon on some of the braised fennel head, and a few olives on top of that. Fold the parchment into a little parcel, and tie with butcher’s twine. Place the parchments on the preheated grill away from the hot spot, and cook each side for about 1 minute. Be careful not to let them burn. To serve, cut open the parcels and drizzle on the lemon relish. Salt before serving.